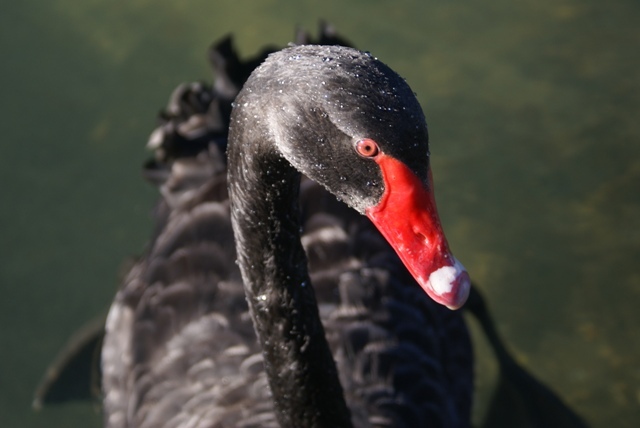 Having arrived in Tauranga on Sunday, 3rd April, and having had a lot of rain, we were pleased to see a good forecast for the following weekend. They forecast a high pressure that for once looked like it was going to hang around for a few days. 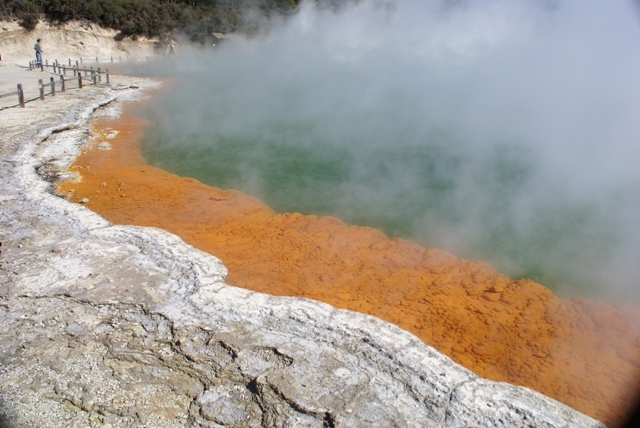 That was all we needed to arrange a hire car and book a couple of motels - 2 nights in Rotorua and 2 nights in Turangi, the northern gateway to the Tongariro National Park. 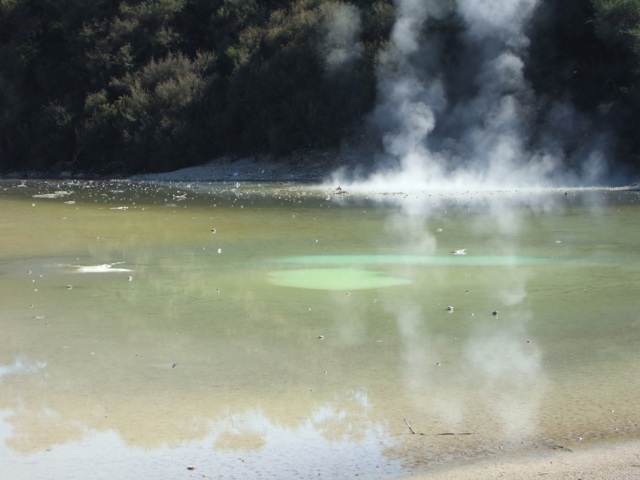 So it was off to Rotorua on Friday the 8th April. It's only about a hour's drive, initially climbing up through green hills and then into lower pasture land. Driving is never dull in New Zealand. 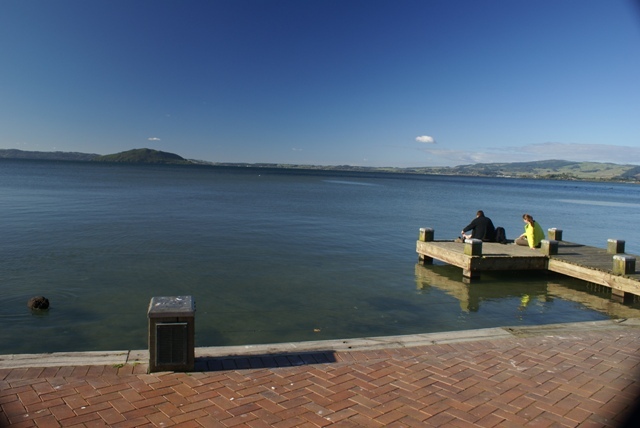 Rotorua is a city (NZ definition - we would call it a town) and much bigger than we were expecting. Some locals refer to it as Roto-vegas and we could see why when we drove in - big wide roads with hoardings and the like all over the place, most unlike anything else we have found here so far. And the motels - we passed loads and loads of motels to get to the one we were staying at. 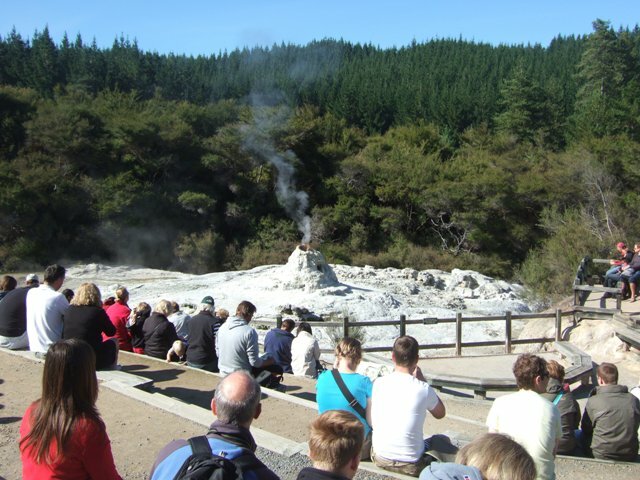 They are all very nicely laid out, as is the city, but it seems totally focused on tourists having a good time, whether sightseeing the geothermal landscape of boiling mud pools, sulphur vents and geysers, the huge lake and surrounding countryside, the Maori culture (it's very strong in this area), taking scenic flights, trekking (or tramping as they call it), extreme adventures (eg white-water rafting, jet-boating and bungy jumping - they have it all here) or the night life. 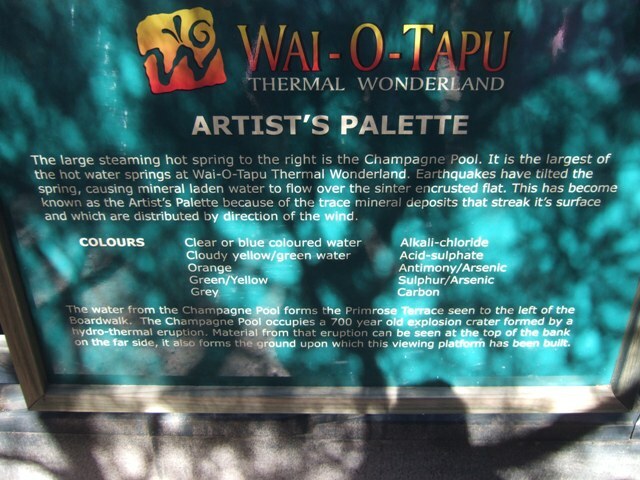 Our first stop was the Polynesian Spa - hot mineral bathing and spa - to have a nice long relaxing therapeutic soak. 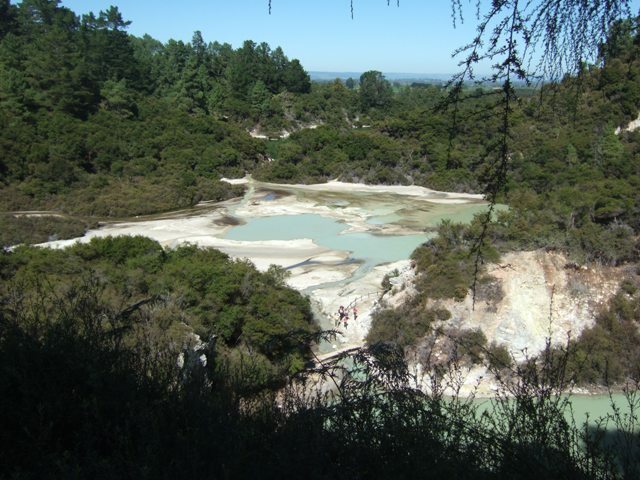 You can have private pools, scenic pools (pools with a better view) or the general pools which we chose - 7 hot mineral spring pools ranging from 38C to 42C - very nice! The next day it was off to see the geothermals. 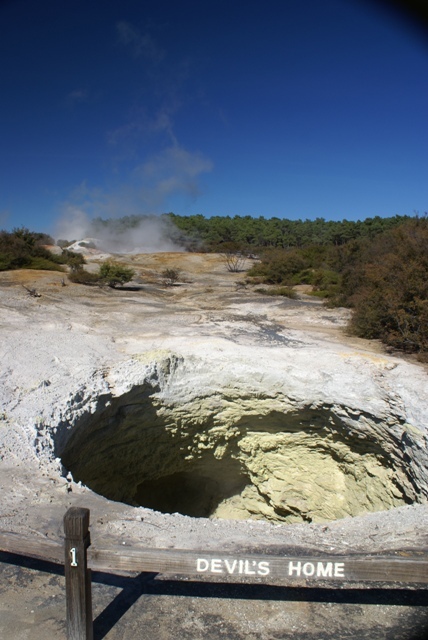 All the well known geothermal attractions are in well established 'theme' parks for which you have to pay, but they are well laid out, all different and worth seeing, especially with blue skies and brilliant sunshine. 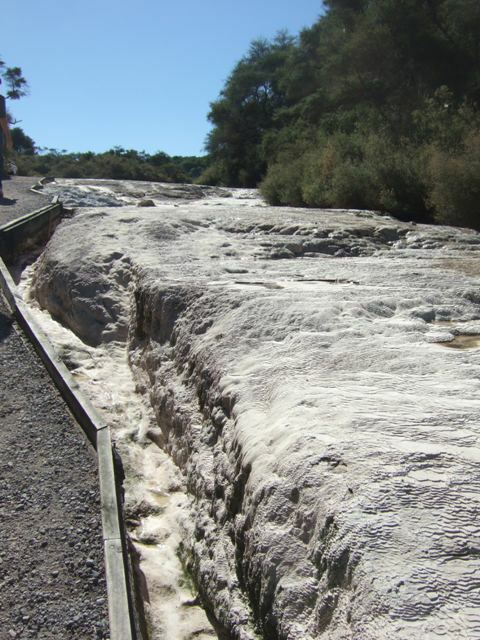 The first, Wai-O-Tapu Thermal Wonderland, has the famous Lady Knox Geyser (erupting up to 60ft), over a dozen volcanic craters, a champagne (coloured) pool, sinter terraces, opal pool and pools of all colours blue-green-yellow, boiling mud pools and lots and lots of sulphur smelling steam! For the range and beauty of geothermals, it was the best. ..... a better view! There were quite a lot on the lake. All waiting for Lady Knox to erupt, at 10.15 every day. 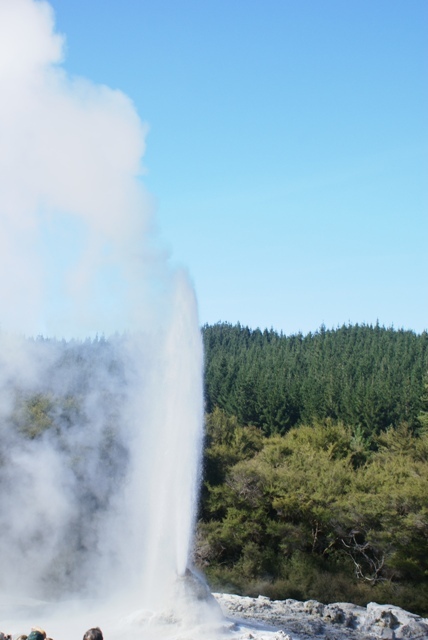 We wondered what caused the geyser to erupt so precisely at 10.15 each day. The reason is simple - they give it a helping hand by adding some soap. Soap is a surfactant that breaks down the surface tension between two layers of water, a cold layer on top and a hot layer underneath. 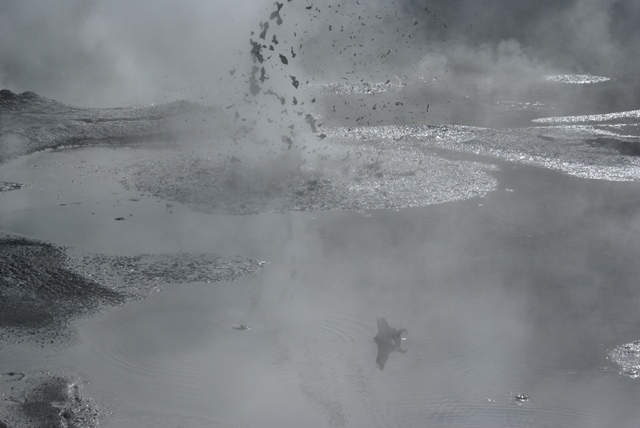 These then mix and steam is created that expands in a restricted space, causing the eruption. 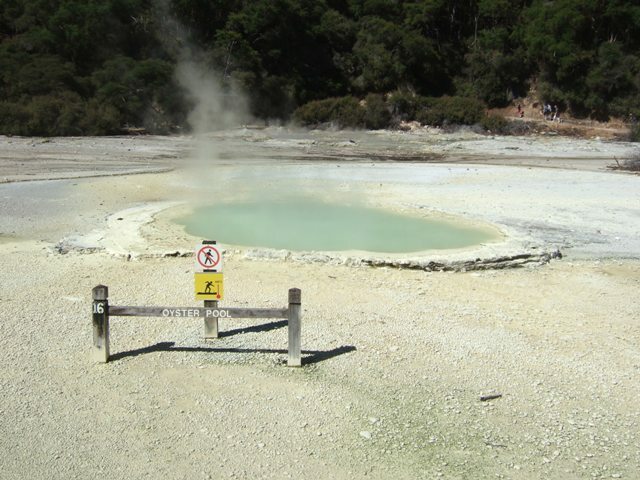 They say that without the soap it erupts naturally every 2 or 3 days. 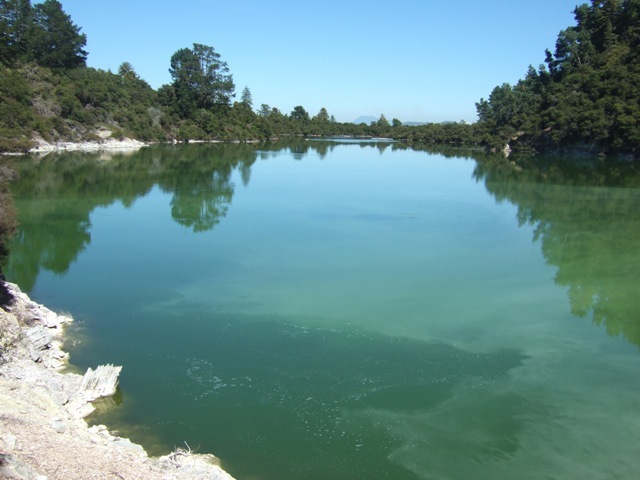 The most vibrant colour we saw - The Champagne Lake. The board below says a bit more. 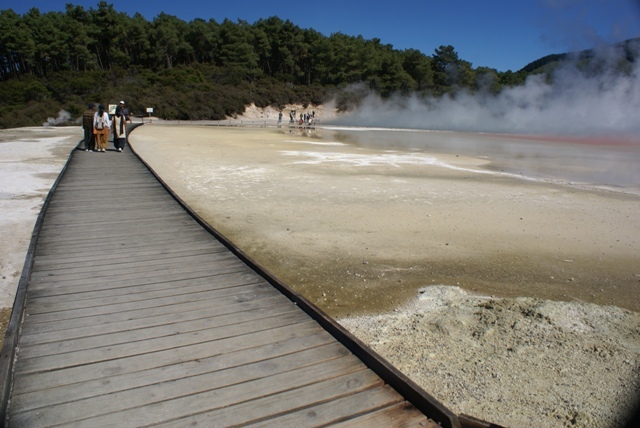 A boardwalk across the Artist's Palette. The wood had to be specially treated for the heat and chemicals. 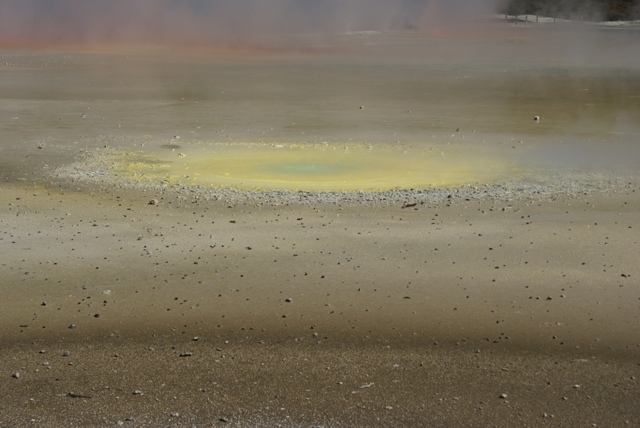 The yellow temperature warning gauge says it's 100C, so we won't get any closer! 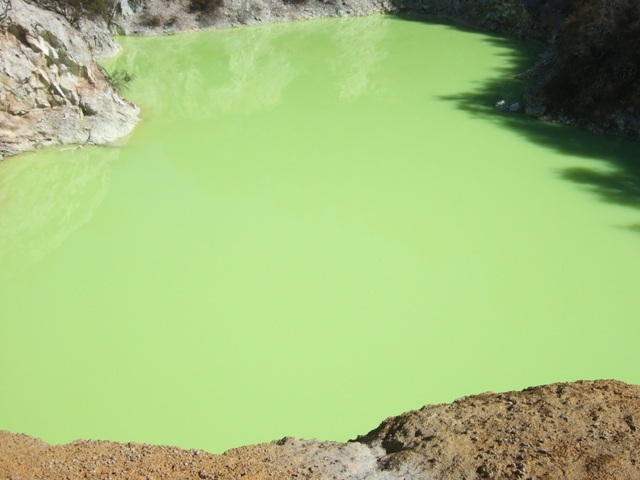 of porous silica or calcium carbonate deposited by hot mineral springs). 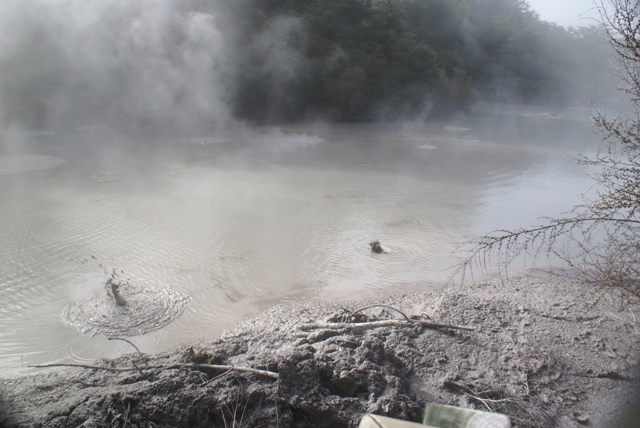 One of the lakes with boiling tributaries and pools. 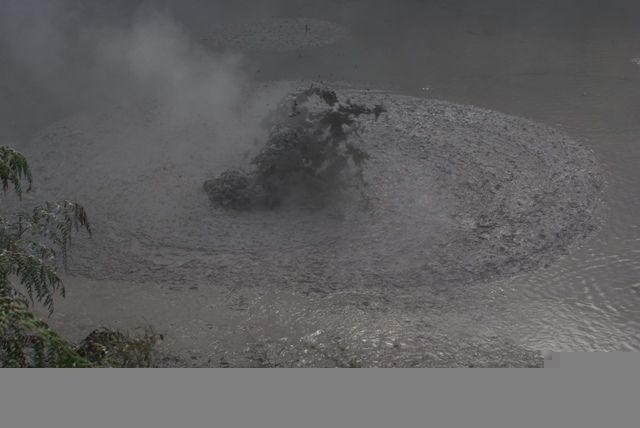 ...... the boiling mud pools! Everything you expect and more is here.